Quality-of-hire is one of the most important hiring metrics that employers use to measure the success of their recruitment efforts. Unfortunately, today's fiercely competitive job market has made the task of not just identifying but also hiring top quality candidates more difficult. This growing demand for talent is forcing employers to look for alternative strategies for finding quality candidates. One solution helping employers attract top talent is the development of an enhanced candidate engagement process. A recent Glassdoor study found that employers were able to increase their quality-of-hire by as much as 70 percent by improving the candidate experience. 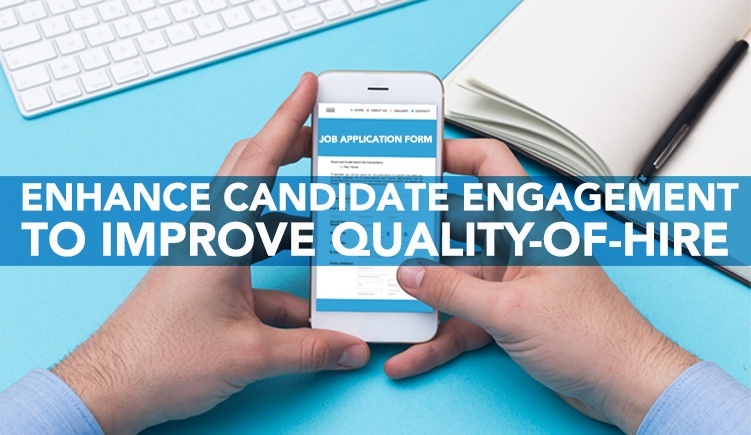 Even more importantly, enhanced candidate engagement can attract both active and passive candidates. There are several steps you can take to enhance candidate engagement and improve the quality of your hires. Lack of communication during the hiring process is a common complaint among candidates. This lack of communication leaves many candidates wondering what their status is in the hiring process or if the employer is not interested. This lack of communication increases your risk of losing quality candidates to your competitors. You can avoid this risk by developing a strong communication process that follows the candidate through the hiring process. An ATS (Application Tracking System) platform enables your company to track this communication and maximize its potential. According to a recent study, more than 60 percent of applicants surveyed admitted to not completing an application because it was too complex or too time-consuming. If your application process is too long, you could lose out on more than half of your potential candidates. Working with an experienced Recruitment Process Outsourcing (RPO) team can help tear down this barrier. RPO agencies continuously develop a pipeline of prospective top talent candidates. They work with applicants to evaluate their skills, experience, education, strengths, and weaknesses to match quality candidate with employers. Today's candidates aren't only looking for improved communication; they also want to build relationships during the hiring process. 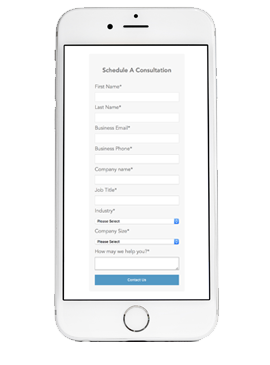 They want personalized attention and to feel like they will become a valued member of your team. This can be extremely difficult for busy companies and hectic HR departments. Even large recruiting firms, who often prioritize speed and quantity, cannot offer this level of engagement. Smaller, boutique RPO agencies, however, specialize in personalized services. These RPO firms work directly with prospective applicants so that when you're ready to interview your top candidates, a relationship has already been cultivated. A recent study shows that 83 percent of those surveyed had a negative view of a company after a bad interview. You want to avoid this by creating an interview process that is beneficial for both you and the candidate. If you are working with an RPO firm, be sure to take advantage of the relationship the firm has already created with the candidate. Review all the information you've been provided with about the candidate before the interview. This will allow you to use your interview time to extract more information about the candidate rather than rehash information you already know. Now is the time to review your hiring process and determine how you can improve the candidate experience to boost engagement. This step has the power to improve your quality-of-hires and increase retention rates. 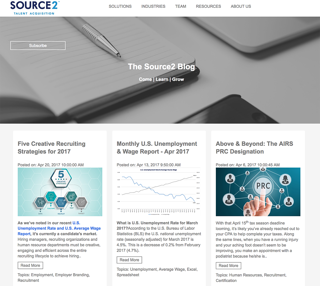 Learn more about how to partner with a boutique RPO firm to enhance candidate engagement by contacting Source2 today.